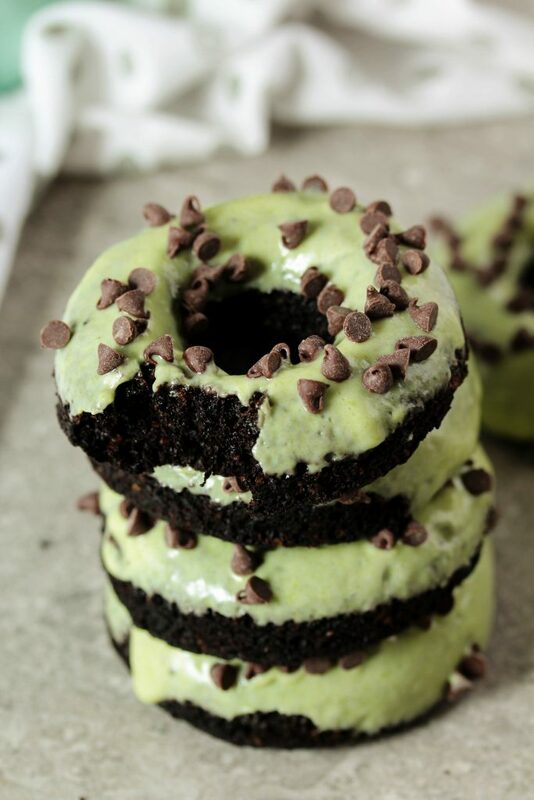 These light and airy cake-like donuts are full of chocolate flavor and are topped with a creamy, peppermint glaze. 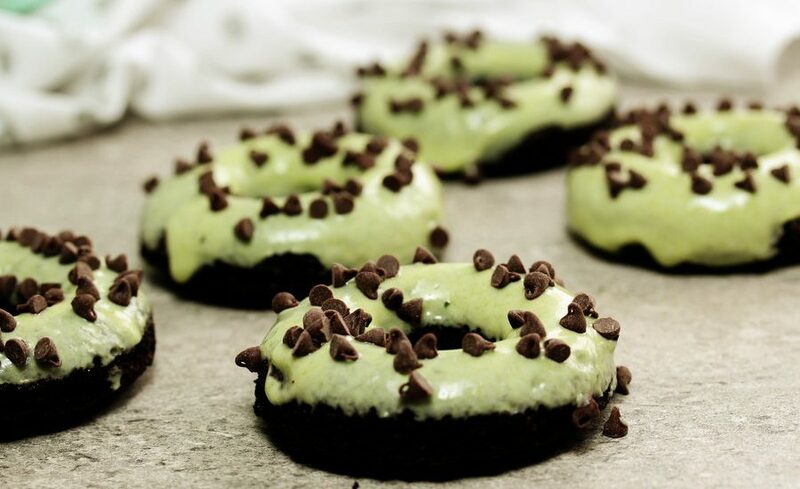 Sink your teeth into these delicious vegan mint chocolate chip donuts that are quick to whip up and will disappear from the plate even faster 😉 . It’s always good to have goals, and my latest baking goal was to make baked donuts without using a donut pan. Spoiler Alert! I failed. Miserably. The donuts were flat and dry. Hey, failing at things keeps you humble, right?? So, I caved and bought a donut pan. And it’s awesome! If you don’t already have one I highly recommend buying one. I got mine at Michael’s Craft Store for about $7 since they always have a 40%-off coupon on line. But, let’s get back to the important part of this recipe – making them! As I’ve said, these donuts are vegan, so we’re using other ingredients to bind our dough besides eggs. I’ve tried this recipe with bananas, pumpkin, and sweet potato. Each one is delicious, but change the taste and texture slightly. 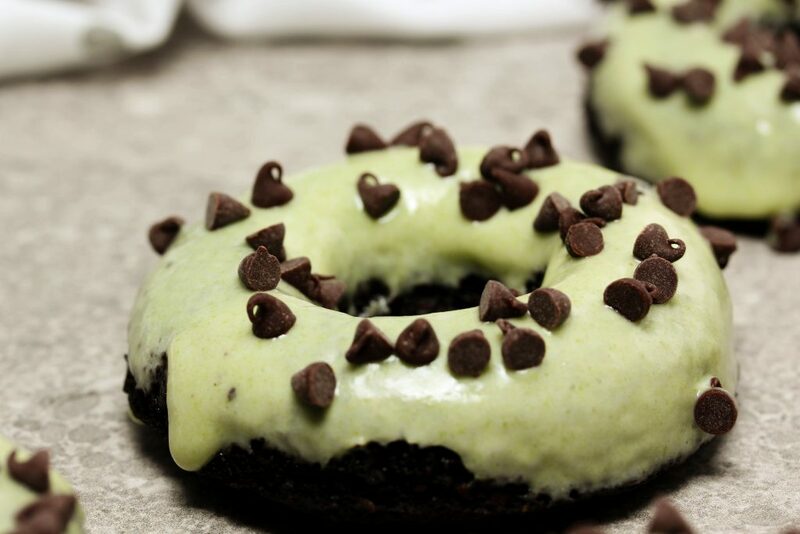 Banana – these donuts are sweeter tasting. There is also a slight banana flavor, so if you like bananas, that’s not a big deal. They are also slightly, for a lack of a better word, gummier in texture. “Gummier” sure sounds like a negative when it comes to donuts, but they’re far from having the texture of a piece of chocolate-banana bubble gum! It’s nothing that should scare you off, but it is different than if you use the other 2 options. Pumpkin – these donuts are less sweet than when using bananas. They don’t have any distinct pumpkin flavor and they are smoother and cakier in texture. Sweet Potato – these donuts are very similar in flavor to the pumpkin version, but a little more dense. All three are great in their own ways! Just choose which description you like more. Or make all three 🙂 ! Now, on to that mint glaze! It’s made with NO Artificial Coloring! Then how is it green, you ask? Spinach! And no, it doesn’t add any flavor to the glaze, I promise! Just an adorable light green hue. The instructions for how to make this all natural, 2 ingredient food coloring is in the recipe’s instructions. It’s sooo easy to make and not at all intimidating, but if you want to leave it out I guess you could say it’s optional… But, c’mon! when is fun food colors an option!? 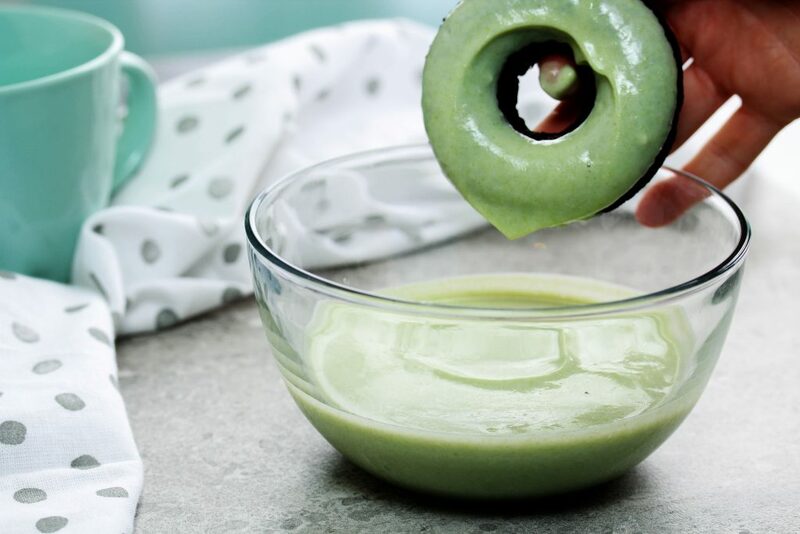 So, once you’ve got your green food coloring ready, just whisk together the glaze’s other simple ingredients and add a splash of that coloring. I prefer to dip my donuts into the glaze because it’s quick and easy and does the job. But, you could also spread it on with a spoon or knife. But, that’s just one more utensil to wash, if you ask me 😉 . 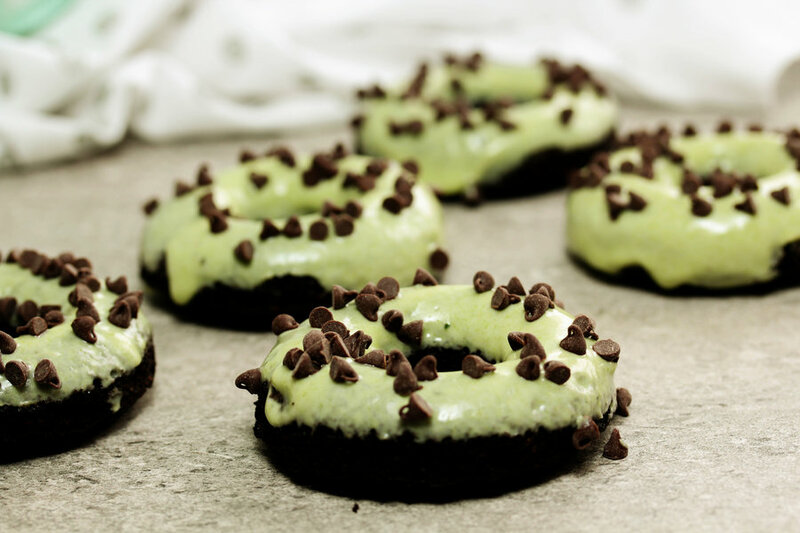 If you whip up a batch of these vegan mint chocolate chip donuts, let me know which version you try! Tag me on my socials – @HealthyHacksRD. For the food coloring: in a medium sized saucepan, add the spinach and just enough water to cover the spinach. With the lid on, bring the water to a boil, then reduce the heat to a simmer. Remove from the heat once the spinach is wilted, about 5-7 min. Drain the water, reserving 2-3 Tbsp. Add the spinach to a food processor or blender and blend until smooth. Gradually add just enough of the reserved water to get a smooth, liquidy consistency. Place the mixture in the refrigerator. Store any unused food coloring in the fridge for 3-4 days. For the donuts: preheat the over to 350 F and generously grease a 6-donut baking pan. 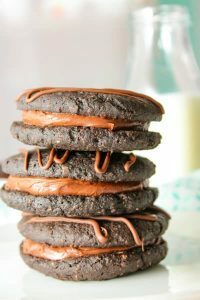 In a medium sized bowl, whisk together the oat flour, cocoa powder, sweetener, tapioca flour, baking powder and soda, and salt. In a separate bowl, combine your choice of pumpkin puree, mashed banana, or sweet potato puree, oil, apple cider vinegar, and vanilla extract. Heat the water (either in the microwave or in a stove top) until boiling. Add the wet ingredients and the coffee mixture to the dry ingredients and whisk together until completely incorporated and there are no lumps. In a piping bag or a zip top bag (with a bottom corner snipped off after being filled) add the donut batter. Pipe the donut batter into the prepared donut pan. Fill up each one 3/4th the way full. Bake for 7-9 minutes or until a toothpick inserted into one comes out clean and they are springy to the touch. Let the donuts cool completely in the pan (about 1 hour), then turn them out onto a wire cooling rack. 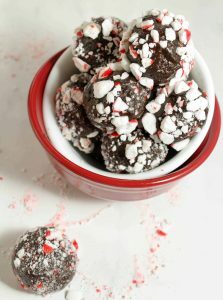 For the glaze: whisk together the yogurt, sugar, cornstarch, and peppermint extract. Add the green food coloring until you get your desired color. If that makes the glaze too watered down, add a little more powdered sugar. Dip the tops of the cooled donuts into the glaze and place back on the wire rack. 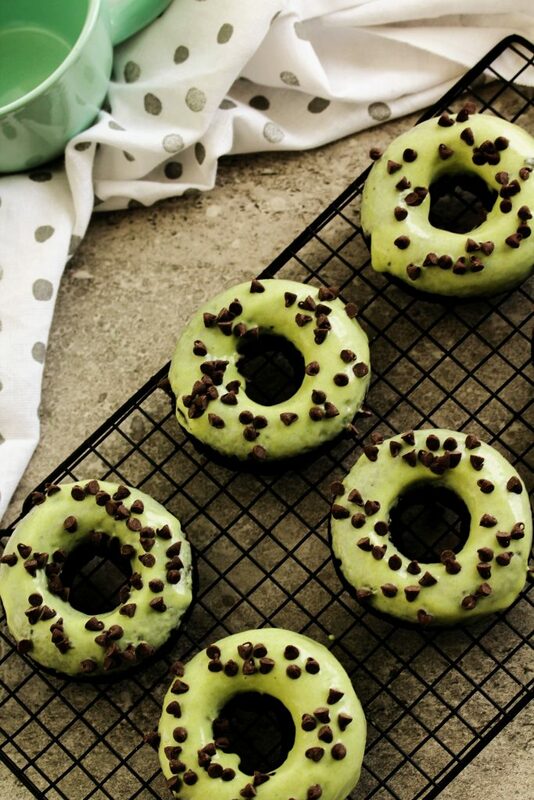 Once you've glazed and added the chocolate chips to all the donuts, it's time eat 'em up! Hi Sophia! I'm so sorry the recipe isn't working for you! I made it this morning to see what the problem might be. I will say, they're a pretty light, airy, and delicate donut, but they held together just fine for me. Did you let them cool completely in the pan? They should cool for at least an hour before turning them out. Also, all ovens are different, so I'd make sure to go by the toothpick test and not the suggested baking time to make sure they're cooked all the way through. Did you use any ingredient substitutions or follow the recipe as is? Also for the peppermint, did you use the extract or oil? Peppermint oil is a lot stronger than extract, but I did take your suggestion and reduce the amount :) Hope this helps!